'Pray the don't come for you!' This November, Gloria is transforming into something very, very strange. 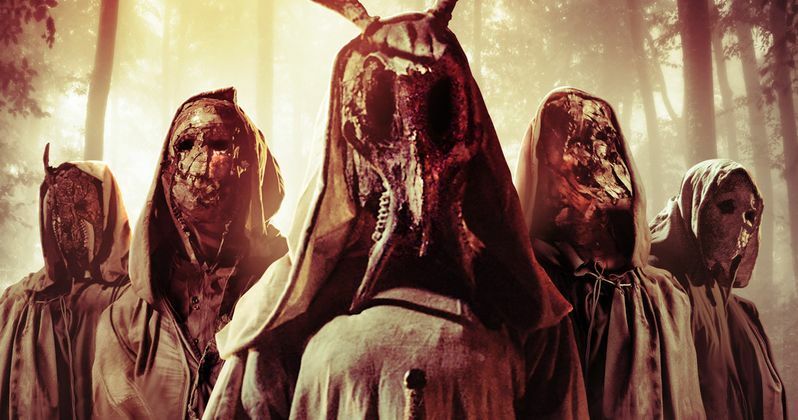 From director Chad Archibald, and in the tradition of Cabin in the Woods and Hereditary, comes The Heretics, which arrives on demand November 6 from Uncork'd Entertainment. A young woman is abducted by a strange man who claims that a cult is hunting her. His goal is to protect her until sunrise but while restrained, she falls deathly ill. As her friends and family search for her, the source of her illness becomes more and more apparent. She's not sick...she's changing. From Black Fawn Films, the award-winning and celebrated Canadian horror machine behind the Antisocial series, Bite, and Let Her Out, comes a film that's "part cabin-in-the-woods thriller, part psychological puzzle, and part demonic possession battleground" (iHorror). Nina Kiri (The Handmaid's Tale), Ry Barrett (Lifechanger), and Jorja Cadence star in The Heretics available on DVD January 5 from Uncork'd Entertainment. Chad Archibald directs The Heretics from a screenplay by Jayme Laforest. The pair perviously collaborated on the horror thriller Bite. Archibald made his directorial feature debut way back in 2010 with the fantasy thriller NeverLost. He's also directed cult hits such as Kill, The Drownsman, Ejecta and I'll Take Your Dead, the later of which is also getting a 2018 release. IMDB has a more extensive synopsis for the movie. A notorious cult kidnaps a young girl, and sacrifice themselves by the light of the locust moon. The next morning the girl awakes, caked in dried blood and surrounded by corpses...but safe - or so she thinks. Years later, the locust moon is about to rise again and the girl is captured once more by a surviving member of the cult. She is taken to a remote cabin where she learns that a demon has been growing inside of her all these years, and before the dawn it will rise. Nina Kiri is the transforming woman at the heart of this wicked thriller. She made her acting debut in the TV movie Geek Charming and went onto secure a memorable role in The CW's hit series Supernatural. She made her big screen debut in the 2016 horror sci-fi thriller Let Her Out, which also comes from Black Fawn Films. That same year she appeared in the horror thriller The Haunted House on Kirby Road and the action family comedy Super Detention, which has been described as X-Men meet The Breakfast Club. She is perhaps best known for her role as Alma in the hit Hulu series The Handmaid's Tale. Now, you can watch Nina Kiri become part of a satanic ritual as she transforms into something terrifying. The Heretics plans to keep the horrors coming throughout the rest of the year, with a first trailer and poster arriving direct from October Coast.